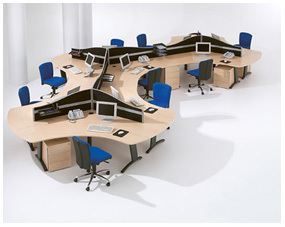 Office Furniture Solutions offers space planning and design. Our professionals can assist you by visiting your new or existing location; provide a computer assisted 2D and 3D visual floor plan that allows you to envision the furniture and/or cubicles that will create your new work environment. Planning a change can be stressful and we at Office Furniture Solutions want to make the process easy and efficient so you have the time to run your business and not worry about your office furniture needs. We will find the “Solution”. We can redesign your space using your existing cubicles and help with the fabric and finish selections of your new cubicles. Our experienced team can handle any project from one chair to hundreds of cubicles. Whether you are planning to expand or move into new office space, we recommend a visit from one of our design professionals to confirm measurements. We work with architects and interior designers who can add in achieving an attractive work environment by choosing the furniture, finishes, upholstery, artwork and accessories. Office Furniture Solutions wants you to be happy with your choices and make the workplace beautiful, functional and a cheerful and pleasant place to work.